So according to Democratic Representative Maxine Waters, if your son is a Tea Party sympathizer, he can go to Hell. You hear that Mom? If your father, mother, son, daughter, sister or brother agrees with the Tea Party platform, they can go to Hell. If your neighbors are Tea Party supporters, they can go straight to Hell. If your boss is a Tea Partier, he or she can go to Hell. If some of your employees happen to be Tea Party members, tell them to go to Hell. If your accountant or financial advisor is of the Tea Party persuasion, tell them to go to Hell. And if some of your customers are Tea Party types, well they can just go straight to Hell as well. If we are to take Rep. Waters for a serious, grown-up, representative of the United States, we should probably start screening the political affiliations of all of our family members and everyone around us, and anyone who is remotely associated with the Tea Party should be sent straight to Hell. Better yet, we should probably just send that list to Maxine Waters so that she can “help them get there”. I imagine she has some sort of connections. 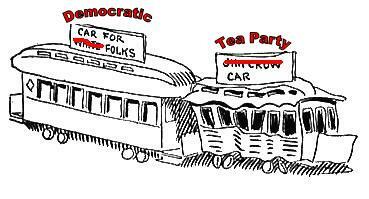 But of course, since I am affiliated with the Tea Party, in spirit and in truth, shouldn’t we treat all Democrats in the same manner? I think not. I love my family, and my neighbors as myself, no matter their political affiliations. Hey Maxine, why don’t you go to Hell? And make me a sandwich on your way down. Maxine needs to explain how her political influence when the Democrats controlled congressional outcomes enabled her husband where he was a director to receive federal money? The Tea Party objects to political influence and the money it generates for the favored few, namely, Maxine Waters and a host of others.